You can set a shower drain without a drain wrench, but it can be a clumsy affair. The shower drain that you would need for a fiberglass shower is called a Caspers drain. I only use brass Caspers drains. Plastic drain bodies tend to fracture at the flange due to the normal movement caused by stepping in and out of the shower. Regardless which you use, a drain wrench may be used to install it. The drain body is held in place by a six sided nut, or a nut with raised grips. 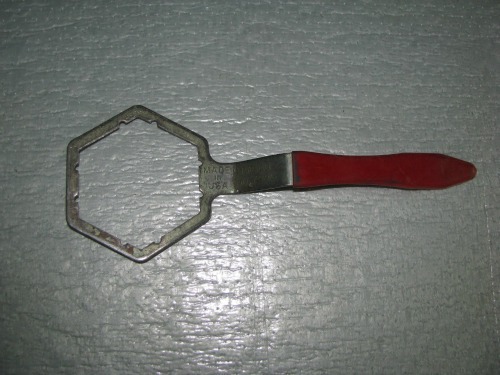 It is similar to the lock-nut of a basket strainer in a kitchen sink. Shower and kitchen sink drains are gasketed from below and their mounting lock-nuts fit the Pasco drain-wrench. Make sure the drains friction washer is between the nut and the gasket. Wearing a glove to protect your knuckles from the rough underside of the shower base tighten the lock-nut of the shower drain till the gasket is compressed. Change the angle of the wrench as you go to keep from pulling the drain off center as it tightens. If the drain is not held from turning by friction you will have to back hold it with a second tool, try a strap wrench. Set the drain grid in place on top of the drain body to make sure the drain is centered enough to allow it to hold in place. When using this plumbing tool to set a kitchen sink drain back hold the strainer with a second tool. For this I like a basket strainer wrench. There are times when the lock-nut of a strainer is too smooth to allow a good purchase for a drain wrench. When this is the case use a spanner or 4 in 1 strainer wrench. There are two more reasons to use brass Caspers drains. The threads of the compression nut of a plastic shower drain are thick and coarse, do to the fact that plastic is a weak material. These threads have a tendency to work loose with the movement of the shower base. The way to seal the void between the drain flange and the shower floor drain orifice is with plumbers putty. A plastic shower drain is ABS plastic and is not to come into contact with the petroleum based putty. Speaking of plumbers putty, whenever you use it to seal the type of drain with a gasket below, as in both shower and sink drains, use only enough to fill the void and remove any excess that extrudes below when the flange is pushed down into position. That excess putty should not be allowed to remain and form a film between the gasket and the fixture base. The clean dry rubber gasket should be in direct contact with the clean dry fixture base.